Vancouver saw an early spring. The cruel joke of Winter Olympics - when I left Atlanta in the south's version of a snow storm, and arrived in British Columbia to record highs and the greenest grass I'd seen all winter. It was magic, there - how misty days would run together and you would find yourself deep in the belly of a cloud. The cloud would lift and - surprise! - you would be surrounded by spectacular mountains, scenery invisible to you the day before. 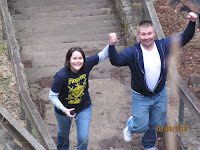 While there, my workmate and new friend, Heather, planned wedding bits from afar. I grilled her for details, and marveled a little at the different aspects of our lives we weave together - work here, wedding and family there. I returned after six weeks away and, in something of a haze, for three days unpacked and did laundry and packed again. We went on Spring Break. Here, too early for such a break - Blue Ridge foothills where nowhere near as green as the foothills of what I believe is the Cascades. It was beautiful, though - with a daily dose of stunning waterfalls and streams. On our first day out, we went to Chimney Rock, and witnessed a marriage proposal. The couple was buoyant, beaming, young. The boy had a rock carved with "will you marry me..." on it, had placed the rock in among the other flat stones of the observation deck. We took pictures. - could you take my camera and get some pictures?" Fantastic. Of course we could. It is, apparently, What We Do. We came home and, in something of a haze, for three days unpacked and did laundry and packed again for a wedding in Florida. We all went - the whole fam. I am in love at weddings. I never love my life, Gavin, or friends and family present, more. Weddings, in almost any form, make me giddy. There were days of activities - great food (all prepared by the bride and groom and presumably, many elves), cocktails and dancing and spanish moss and bluegrass and sunshine. Friends from long ago- still themselves, all still versions of who they were 20+ years back. From the Cuban sandwiches Thursday night to setting the pitch via pitch pipe for Amy's rehearsal Saturday morning to playing with my godson and twin Sunday afternoon (while possibly hungover)... A perfect weekend, bracketed by rain that never fell on any of it. I kept being struck by all the work we put into Beginning. All the attention paid to Starting. For our wedding 13 years ago, I only knew there would be a mass, and I wanted friends and family accounted for, people from different stages of each of our lives in one place. I wanted to count heads and feel love and dance to great music. I wanted the accountability of an audience. With a couple of gin and tonics and dancing after. At weddings - Andy and Todd last year, Bill and Gia this - there is so much optimism. So much promise and enthusiasm and prayers both spiritual and secular. Everything changes, right there. And yet nothing does, really. 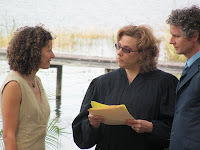 Denise officiated, and we watched, and I thought, wow. So much has been bestowed upon her. Bill and Gia wrote their own vows. And they stood there - and they promised. And by the power invested in her, Denise pronounced and introduced. Spring has sprung, beginnings have begun. Let's get started. Wonderful post as always. I especially enjoyed your 2nd to last paragraph. "Beginning...Starting..." Sweet post. Had no idea it was a first wedding for your littles!